After a wonderful few days off spending time with family in San Diego and LA, I'm back in the ol' studio and bloggin' away. No real news to report from the days off, except this: For Christmas, my wife and I got each other only one li'l gift each. My gift from her? It's pretty awesome, actually: Star Wars bed sheets. They're quite ridiculous. I love 'em. Also: Lots of e-mails from American Sheldonistas reporting that Hobnobs are suddenly appearing in lots of new stores in mass quantities. And behold: A cartoonist in LA gets instantly fatter! Also, also: Please e-mail me any Christmas-day photos of family unwrapping their Sheldon books, etc. That kind of stuff means a lot to me. 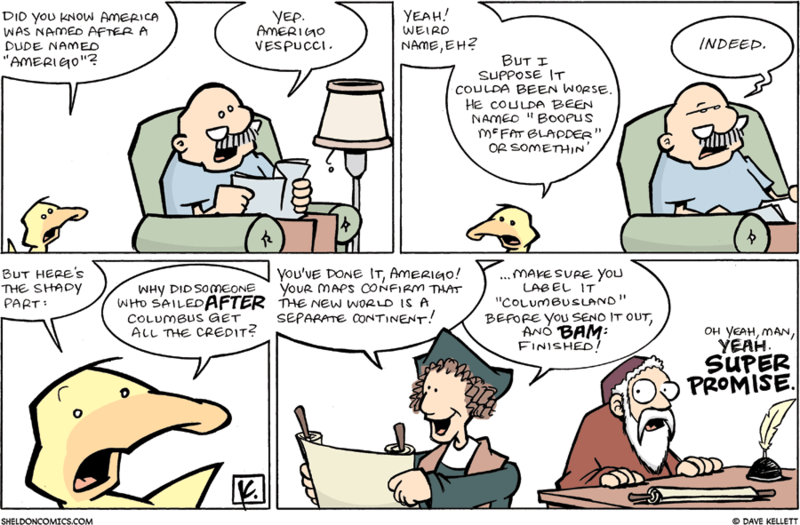 Also, also, also: Regarding today's strip, I think "God Bless America" is a pretty awesome cussing-replacement phrase. Try it when you're really mad: It's funny...especially when there's a tenth-of-a-second pause after "God". What's the best cuss replacement you've ever heard used?